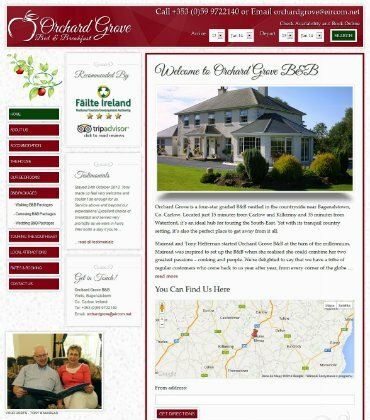 We were commissioned to deliver a Website Design for Orchard Grove, a four-star graded B&B nestled in the countryside near Bagenalstown, Co. Carlow. Located just 15 minutes from Carlow and Kilkenny and 35 minutes from Waterford, it’s an ideal hub for touring the South-East. Yet with its tranquil country setting, it’s also the perfect place to get away from it all. Our brief from the client was to deliver a new responsive Website Design which would provide Orchard Grove with a search engine friendly website design that would rank well organically and generate leads and sales for B&B for Orchard Grove.